My leave is over. It ended on July 1, and the fact that I’ve waited this long to post anything here could be taken to mean that I wish I were still on leave. But that’s not entirely true since I made good headway on my project—good meaning that I now have a finished manuscript that I can play with in the coming months. I am also happy to be back—happy meaning that while I am grateful to have had time to work on this project, I also enjoy administrative work. Administrative work sometimes gets a bad rap in the academy, and I am halfway tempted to go on about the glories of bureaucracy. However, I promised back in February that I would say something about how I spent these last six months, so any thoughts on that will have to wait until my next post. As for my leave, I used the time to wrap up a family history of Ivy League football that I have been working on for the past five years or so. The quick take on the project looks something like this: my grandfather played football at Dartmouth, where he earned All-American honors (as a guard), and then went on to a twenty-five year Hall-of-Fame career as a college football coach; my father went to Yale in the early 1950s, and was captain of the football team there (he played fullback and linebacker); and I attended Yale in the 1970s and likewise played football (I was an offensive guard). In tracing this intergenerational history, I focus on the relation between football and higher education, trying to get at what the males in my family learned from playing football. I also look at how the game was passed down from father to son, an emphasis that gives the project a personal dimension and has nudged the manuscript more in the direction of memoir. Ranging over almost a century of football history, the chapters about my family members—titled “Coach,” “Captain,” and “Legacy”—describe the three different ways in which my grandfather, father, and I played the game. My first try at connecting family and sports history was an essay I wrote about Bronko Nagurski, whom my grandfather coached at the University of Minnesota in the late 1920s. My friend Elliott Gorn had asked me if I wanted to write something for a volume on Chicago sports that he was editing, and I figured this would be a good opportunity to wade into family history as well. Moving from this essay to a book-length treatment of my family’s involvement in football has posed a variety of challenges, not the least of which was getting over my initial worry that writing about my family (and myself) was self-indulgent. Although we live in the age of memoir and reality television, doing “me-search” and writing first-person history struck me as unseemly. On the other hand, as I considered the scope of the project, I persuaded myself that I had an interesting if not unusual angle on a much discussed (and debated) topic: the role of intercollegiate sports in higher education, or what William Bowen has called “The Game of Life.” So I moved forward. To give you a sense of the kind of issues I’ve been writing about, I am including below the captain’s portrait taken of my father in 1951. It is customary at Yale to photograph captains on a replica of the Yale fence and against the backdrop of nineteenth-century New Haven. The fence is a vestige of old Yale, and a symbol of the student world that was both separate from and connected to the official college. 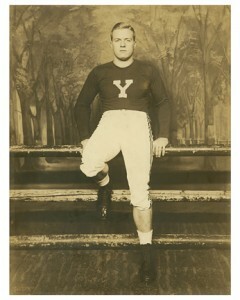 Athletic captains were important leaders in this “extracurriculum,” which gathered steam in the early twentieth century, and so the portraits captured the “Yale man” in a particularly ritualized manner. Of course, since 1969, when Yale went co-ed, captains of women’s teams have been photographed on this fence as well. This photograph also had a more personal meaning in my family, not just because it hung on our basement wall with other family memorabilia, but also because my father contracted polio several years after graduating from Yale and subsequently walked with a limp (and often a brace). So when I was a child this portrait—and others—brought into focus an aspect of my father’s life that had slipped from sight. While this example is specific to my own family, it provides a glimpse, I think, of how imbedded sports are in our culture. Glad to have you back into the glorious fold of Middlebury bureaucracy and good luck with the book. Good to see you back, and I look forward to the new book. (I’ve got 100 Years on the Road on the nightstand now.) Will you be getting back to the radio as well? It’s been too long since we’ve spun records together. Thanks to you both for the good words. . . . Cole: we are hoping to get our usual slot on Friday afternoons at 3, but we’ll know in a couple of weeks once WRMC sets its schedule for the fall. Then I hope we can get you up here to play some tunes–soon! Thanks for the post. I am very glad after ready and get useful information about the philosophy and psychology from your blog.